I see the media are laughing at Sarah Palin when she referred to the White House being at 1400 Pennsylvania Avenue. And yet no one laughed at Google in 2009 when it didn’t know what was at 1600 Pennsylvania Avenue. Mrs Palin and I have very different political beliefs and I’m not a fan of hers, but I’m curious why no one had a go at Google in 2009. Such an error by one of the largest companies in the US deserves more ridicule than whatever she said, which is akin to President Obama’s 57 states and his mispronunciation of corpsman, or Vice-President Biden’s belief that a hypothetical President Roosevelt could go on television in 1929. This was not version 1 of Google Maps, but version 5. 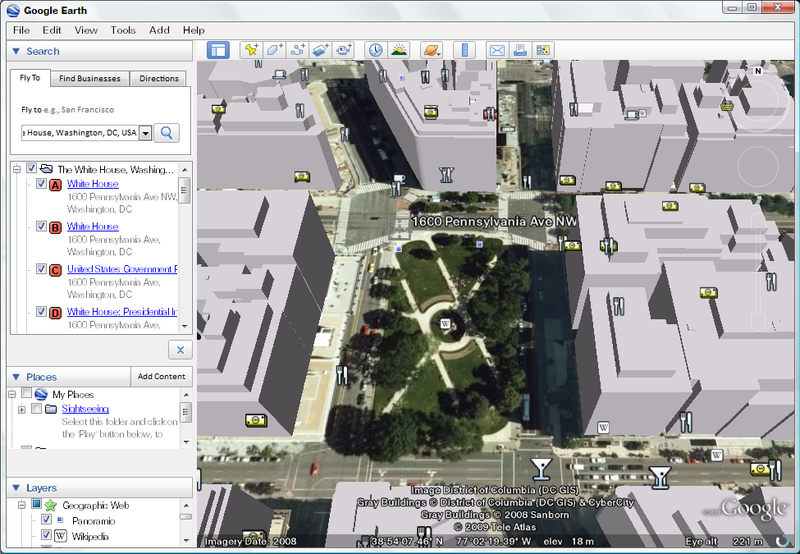 This means that in five versions of Google Maps, no one had checked where the White House was. And do you wonder why I don’t have much faith in Google? Nothing around here even looks like the White House. Can any American readers please explain what I am doing wrong, or is this another one of those computer glitches that only happens to me? the Manhattan Project has beamed up the entire White House. A Washingtonian confirmed that when they typed the same address into Google Maps, they got the same result, so it wasn’t just me. Since 2009, this error has been remedied. Do you mean Google Earth? Yes—shows you how often I use Google now! Again, an error more minor than Google’s.